"cancer can't keep a good pet down"
Join us on FRIDAY, MAY 18th, 2018 for a very special presentation on the early warning signs of pet cancer, along with myths and misconceptions of pet cancer treatment. We would like to extend a warm welcome and thank you to Dr. Seth Glasser, veterinary oncologist, for giving this presentation! Join us on SATURDAY, AUGUST 4th, 2018 for a yummy treat that you, your dogs, and your kids will enjoy! We will be serving ice cream from 11:30AM until 4:00PM at The Animal Doctors (on State Stret in Watertown, NY). There will be pet-friendly homemade ice cream for your best buddy! It's $5.00 per person (with or without a dog); children 12 years and under are FREE! All of the proceeds will benefit Paws4Potter so that more educational events can be funded! "Making A Mark On K9 Cancer"
Our 3rd annual dog-walking event is coming up on SATURDAY, SEPTEMBER 22nd, 2018! Click here for more information or to register for the event online! If you represent a business and wish to become a sponsor or vendor for the event, you can view our business registration form here and sponsorship levels here. At this time, we cannot accommodate online registration for businesses; the registration form must be mailed in. If you have any questions about the event or wish to register for the event as a business or an individual registrant offline, please e-mail us at paws4potter@gmail.com. Pre-registration for BUSINESSES ends on Wednesday, September 12th! Pre-registration for INDIVIDUALS ends on Wednesday, September 19th! If you would like to purchase an event t-shirt, you must pre-register by September 5th to ensure your t-shirt size! Individuals may still register on-site the day of the event! You DON'T have to own a dog to participate in this event! We only ask that you LOVE dogs! 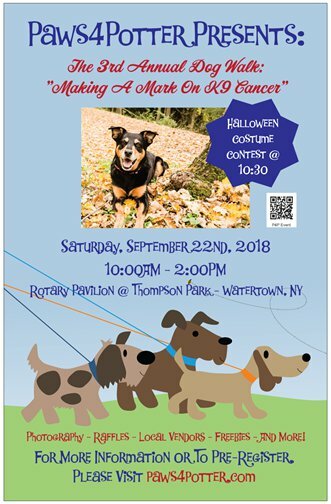 Among other activities, there will be a demonstration by the NYS Police K9 Unit, a dog Halloween Costume Contest, other contests for your dogs to enter, face-painting and balloon animal creations (courtesy of Fifi D. Clown), food that can be purchased for the dogs AND the humans (through City Dawgz of NNY), games for the kids, crafters/vendors, and a dog photo op (by Patrick Danforth Photography)! This event is being emceed by RYAN GRANT!!! 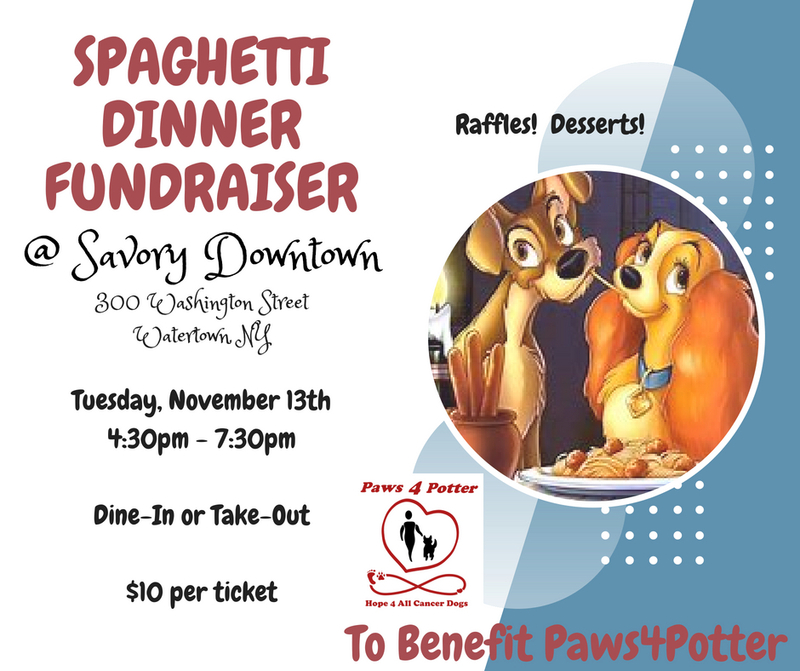 If you would like to purchase tickets for our Spaghetti Dinner fundraiser (held on 11/13/18), please stop in at The Animal Doctors (Watertown, NY) or email us at paws4potter@gmail.com! We will also have desserts for purchase, as well as raffle items to bid on! "Detecting Cancer Earlier In Your Pet"
Paws4Potter is incredibly excited to announce that it will be hosting Dr Sue Cancer Vet again in 2018!!! If you missed hearing this amazing veterinary oncologist speak in NNY and CNY in 2017, you have another chance to do so in 2018!!! On Saturday, November 17th, 2018, Dr. Sue Ettinger (DACVIM - Oncology) will be speaking to the general public (pet owners) in Albany, NY at the Desmond Hotel and Conference Center about a subject that she is very passionate about . . . early cancer detection in pets! You WON'T want to miss this unique opportunity to learn how you can be your own pet's hero and best advocate! This is your chance to be empowered! If you #SeeSomethingDoSomething! If you find a lump on your pet, #WhyWaitAspirate! This public lecture event is FREE to everyone!!! Our goal is to empower as many people as possible with this knowledge!!! Because the seating is somewhat limited, we are requesting that you reserve your seats for this event. You can do so by clicking here or by e-mailing us at paws4potter@gmail.com. From 6pm-7pm, you will have the opportunity to meet and greet Dr Sue Cancer Vet, as well as the event sponsors. Just before 7pm, we will have a short video presentation on pet cancer warriors. Dr Sue Cancer Vet's presentation will commence at 7pm. 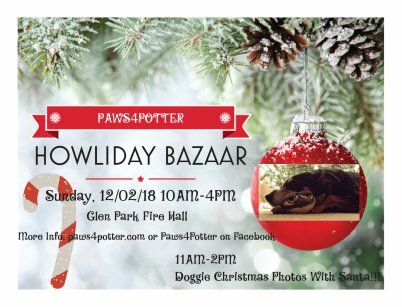 On Sunday, December 2nd, 2018, Paws4Potter will be hosting a small, but mighty craft and activities fair at the Glen Park Fire Hall (in Glen Park, NY) from 10am until 4pm. Santa Claus will be making a guest appearance between 11am and 2pm so that you can have your dog's (and/or kid's) picture taken with him! There will also be an opportunity for your kids to do a craft project! The crafters/vendors participating in this event can help you check some people off your Christmas gift list! Join us for this fun, dog and kid-friendly event on 12/2/18! All proceeds from this fundraiser will go to Paws4Potter and the National Canine Cancer Foundation! Join our event page on Facebook for more details and up-to-date information!